Real-time phishing detection highlights Webroot’s upgrades to its three major SecureAnywhere products for retail users. The company on Monday announced new versions of Webroot SecureAnywhere AntiVirus, Webroot SecureAnywhere Internet Security Plus, and Webroot SecureAnywhere Complete. All are available for yearly subscription rates. Webroot’s answer to slow-scanning antivirus programs is to put its services in the cloud. Webroot’s products are supposed to load quickly and tread lightly upon system resources. As a file starts, the program sandboxes it and watches it run before it’s allowed to proceed. If something needs to be cleaned, the programs tackles the infections and can restore the system to an earlier, safe state. 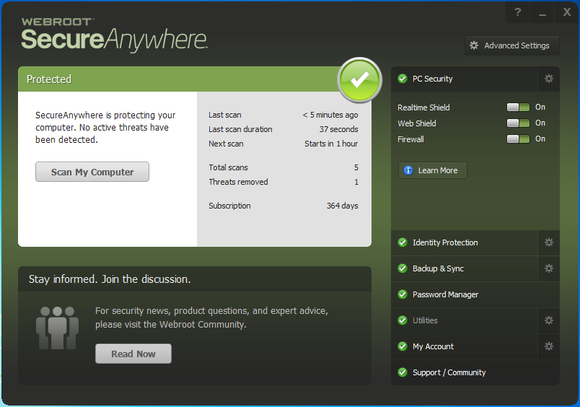 The Home screen for SecureAnywhere products is designed to be consistent no matter which version you have. The company also redesigned the interface of the products so it would look consistent across platforms—a nice convenience for families or businesses managing multiple machines. It’s no small task to compete against established brands like Norton and McAfee. Webroot’s cloud-based service offers an alternative that should serve it well as mobile devices demand support equal to what plain old computers have enjoyed for years.